When a company fails to post the correct ADA signage or other pertinent elements to provide adequate access for the disabled, it opens itself up to litigation. While certain companies just fail to upgrade their buildings and property because they misunderstand what the regulations state, this will not keep attorneys from filing a lawsuit against the companies, which may result in substantial fines. For this reason, businesses must be vigilant at all times, and learn the proper California disabled parking signs and other ADA signage that California requires them to post in their buildings and parking lots. Not posting the correct disabled parking signs is a major reason for a lawyer to target your company with a lawsuit. On top of these signs, you may also need truncated dome pads and a painted symbol on the disabled parking spaces that comply with California ADA regulations. The truncated dome pads assist the visually impaired in traversing the parking lots in a safe manner. When the disabled parking signs and other above elements are not visible and with the correct fine amounts, advocates may complain and cause further scrutiny of the exterior and interior of your building. Parking lots in California need to contain a R100B, tow-information sign at each entrance and one of the R99C, California disabled parking signs that state a minimum fine of $250 for violators per handicap parking space. One or more disabled parking space should also contain a van accessible R7-8B placard. Regardless of the kind of business, you should also display the proper ADA-compliant Braille signs in the interior of your building on top of the disabled parking signs out in your parking lot. Companies that receive a high amount of public traffic, such as medical offices, restaurants, retail shops and more go through an inspection to ensure they are in compliance before they can legally open. Even insurance companies will come under scrutiny for this signage. For example, we recently received orders for California disabled parking signs and Braille signs for a big-name insurance company's independent agencies scattered through the area of northern California. The agencies were the target of a lawyer since they have deep pockets so to speak. No matter what the reason, the agencies had to upgrade many of their ADA signage that was not compliant with California regulations to avoid further legal issues. They also may have had to pay significant fines on top of the cost of this upgrade. Even though recent measures have been enacted to decrease the profitability from frivolous lawsuits over minor issues with the California disabled parking signs or other ADA signs, you should understand that not all ADA-compliance lawsuits are frivolous in nature. 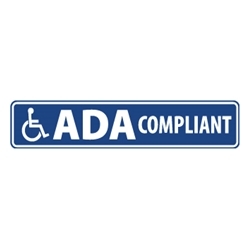 For this reason, your company needs to be proactive in complying with ADA regulations regarding the disabled parking signs and other pertinent signage. The majority of small-business owners, such as yourself, need to display complaint bathroom signage that includes one tactile wall sign that contains Grade-2 Braille for the wall next to each bathroom. In addition, a door sign without Braille should go on each bathroom door since a Braille version would be hazardous to the visually impaired in this location with the doors opening and closing regularly. You also will need to post an ISA window sticker in a front window next to the building's entrance to broadcast the fact that your building is ADA accessible. In addition, EXIT tactile and Braille signs are necessary to direct visitors to the appropriate exit. All of our signs are high quality and durable, whether they are for the building's interior or exterior areas, including the California disabled parking signs necessary for your parking lot to be in compliance with the state's ADA regulations. Please, browse through our site for all the signs you require for your property to prevent ADA-compliant lawsuits against your company.